“It is absolutely impossible!” While the student next to me was the one to vocalize an incredulous attitude, everyone was thinking it. We were in a workshop provided by the National Science Foundation (NSF), as NSF Graduate Research Fellowship Program fellows, and we were tasked with explaining the importance of our research to someone with a nonscience background in less than four minutes. My mind was running wild, thinking back to writing pages and pages of grants. Back then, I thought it was necessary to be verbose to make my science clear. Now I was being told I had to be condensed and exclude any jargon. While seemingly impossible, the task was important. This was the first effort by the NSF to produce a science communication workshop for their fellows. Over the course of two days, we were taught why communicating science — to both colleagues and the public — is crucial to our personal success and the success of the field. In our scientific journeys as graduate students, we are expected to give journal club presentations and lab meetings, and present our data at conferences. We know that the ability to communicate with other scientists fosters collaboration and, ultimately, the advancement of science. While this type of communication is emphasized throughout our training, removing the jargon and finding ways to communicate with people outside of science are relatively minor aspects of the training process. In the current political climate, concerns about potential cuts to research funding abound. As scientists, we need to provide context and greater understanding of how our work expands knowledge and benefits society as a whole. It’s our responsibility to communicate why federal funding is so paramount to that effort. Additionally, communicating to a broader audience helps us as scientists. 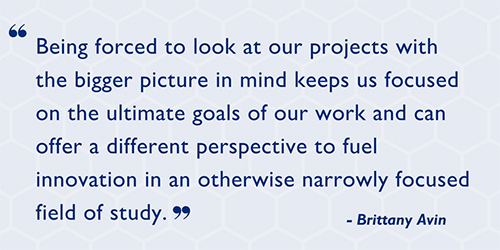 Being forced to look at our projects with the bigger picture in mind keeps us focused on the ultimate goals of our work and can offer a different perspective to fuel innovation in an otherwise narrowly focused field of study. Through the course of the workshop, we were guided on how to properly communicate our science by framing it within the context of how it can impact national security, health care, global competitiveness or the economy, so that the general public can see the importance of our work. We also learned how to communicate complex scientific concepts through metaphors or analogies by framing what a gene or protein does in a way that everyone understands. By the conclusion of the workshop, I successfully edited my presentation down to the time limit and felt confident that it was something the public could understand. The workshop was extremely helpful and a real paradigm shift. As trainees, I think it is extremely important to be able to effectively communicate with a wide variety of audiences. Communication is the only way we can successfully share our ideas and garner support. Frankly, our work depends on it.